As Michael McGrath, the Fianna Fàil finance spokesman, has said recently, mortgage lending rates in Ireland remain dramatically out of line with rates charged elsewhere in Europe. He gave an example of a €200,000 mortgage where an Irish homeowner could be paying over €250 a month more than many similar Eurozone homeowners. 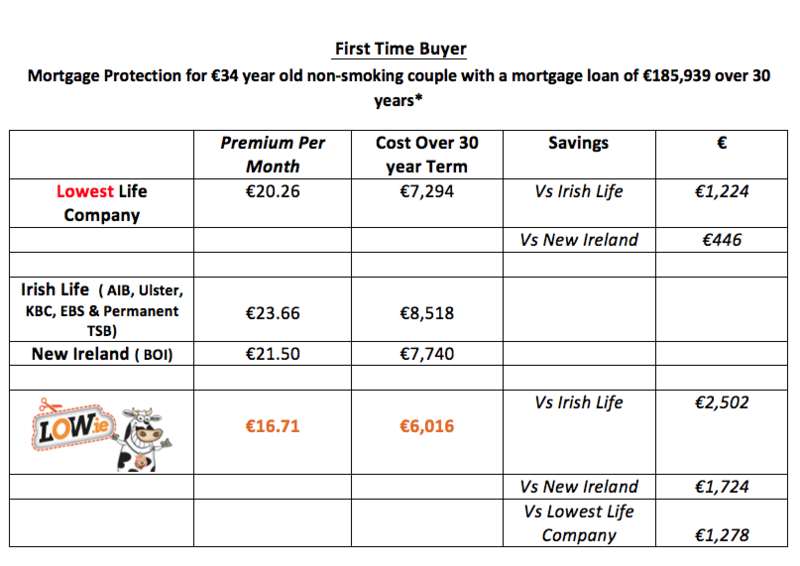 Unfortunately for the Irish homeowner they could also be paying a lot more than they should for the mortgage protection insurance that each bank requires them to take out for the loan. In both cases the culprit is the same, namely the Irish banks. On the interest rate side the average interest rate on new variable rate mortgages here is twice that of the eurozone average according to the Central Bank and on mortgage life insurance by being all wedded to one provider ( AIB , Permanent TSB , Ulster Bank , KBC and EBS to Irish Life and in Bank of Ireland’s case, New Ireland), consumers are also getting a poor deal on their mortgage protection cover. In May the Central Bank published a new Economic Letter, providing a detailed overview of mortgage lending in Ireland last year. 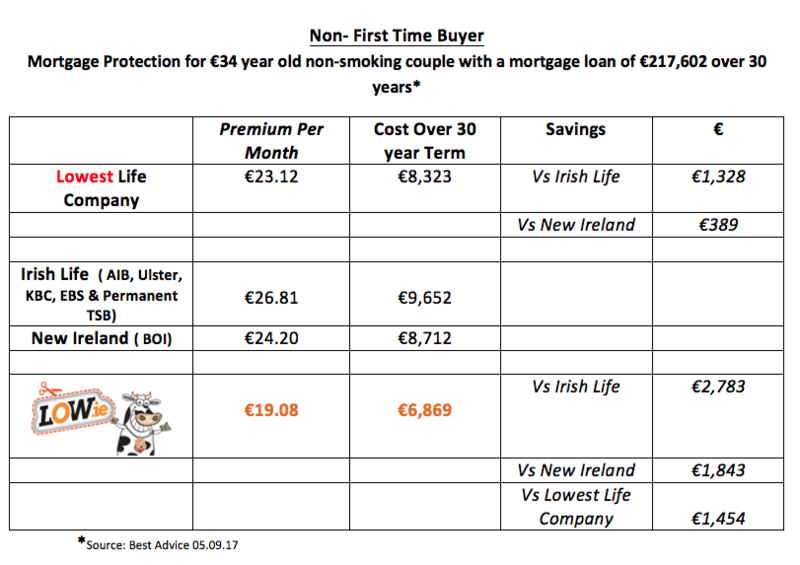 If we take their stats for the average First Time Buyer Mortgage of €185,939 and their average age of 34 and assume a home loan with a term of 30 years then anyone who goes with AIB, KBC, Ulster Bank, EBS or Permanent TSB could end up paying €1,224 more over the term of their policy. Bank of Ireland customers don’t fare as badly even though they would be paying €446 more. However, this is only comparing them to the lowest life company. If we add it very competitive players like ourselves (Low.ie) the difference is stark. AIB, KBC, Ulster Bank, Permanent TSB and EBS customers would be paying €2,502 more whilst BOI customers would be less well off by €1,724. The Central Bank also gave an average mortgage for non- first time buyers of €217,602 and using the same comparatives again it is clear how uncompetitive the banks are and how costly this is for mortgage holders. For example, AIB, KBC, Ulster Bank, EBS or Permanent TSB customers would be worse off by €1,328 compared to the lowest life company quote and by a hefty €2,783 compared to Low.ie. There is no legal or similar diktat that says you have to go with the bank that provides you with your mortgage for your mortgage protection life insurance. All the life companies in Ireland are financially very strong, have been here many years & have excellent claims records not just Irish Life and New Ireland. Getting a mortgage is a stressful process so when curved balls like ‘ You are best getting your mortgage life insurance from us as assignment of another company’s life policy could take three weeks’..IGNORE as it will take no longer than three working days and can be done even quicker. If perchance a bank is misinformed enough think that by going online you cannot get the same level of financial advice. Remember all the major online players like Low.ie have qualified financial advisers who liaise directly with the customer by phone, text, email or whatever suits to deal with all their concerns & queries. Should mortgage debt be written off?